As I continue to pursue a degree in Economics, I find myself applying more economic thought into how anime conventions are, as seen in the "The Mathematics of Conventions" series. But, I remember about two years ago when I did such a thing, applying the CPI Index to the cost of a Ouran Private Academy uniform. Here, I will revisit that post and add in some new numbers reflecting new points in my "cosplay career." On April 5th, 2006, Ouran High School Host Club debuted in Japan. 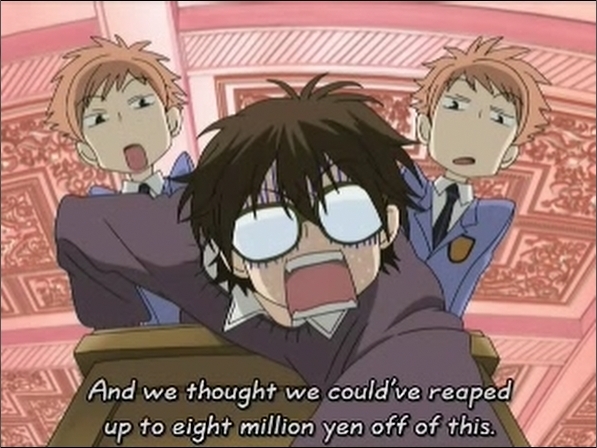 In the episode, Haruhi breaks a vase that the club could of gotten up to ¥8,000,000 in an auction. How much is that worth in Sept. 2009 USD? First off, we must change the currency from yen to dollars. The yen to dollar rate was 0.0085 on April 5th, 2006. Therefore, a ¥8,000,000 broken vase in April 2006 is worth $73,063 in real Sept. 2009 dollars. Now, let's look at two other points to compare costs: the month that I retired my Mori cosplay, and the current CPI numbers from December 2011. FanimeCon 2011 was the last time that I cosplayed as Mori. The CPI from May 2011 was 225.964. Recall that the CPI in April 2006 is 201.5. That same ¥8,000,000 broken vase in April 2006 is now worth $76,444.24 in real May 2011 dollars. The current CPI numbers for December 2011 is 224.939, so naturally this number will be lower than what it was in May 2011. The ¥8,000,000 broken vase in April 2006 is worth $76,097.48 in real December 2011 dollars. I really enjoy applying economics to both anime and anime conventions, and it helps me to improve my skills while learning about the inner workings of anime conventions, from selling products to room stuffing. And as I find more things to do work on, I will share them with the world just like my reports and stories.